CAD Viewer 9.0 Markup QA is an essential tool for Managers, Engineers and Quality Assurance Officers. If you are still printing or plotting drawings and adding numbered stamps and revisions by hand, then CAD Viewer 9.0 Markup QA is for you! Save your valuable time and resources with our QA stamping software that overlays drawings with auto-numbered stamps and markup notes and corrections (text, sketches, boxes, lines and arrows). With just a press of a button the drawing, along with the revision stamps and markup notes/corrections, can be saved to a PDF and sent in an email. The source drawing remains untouched by the stamping and markup operations. 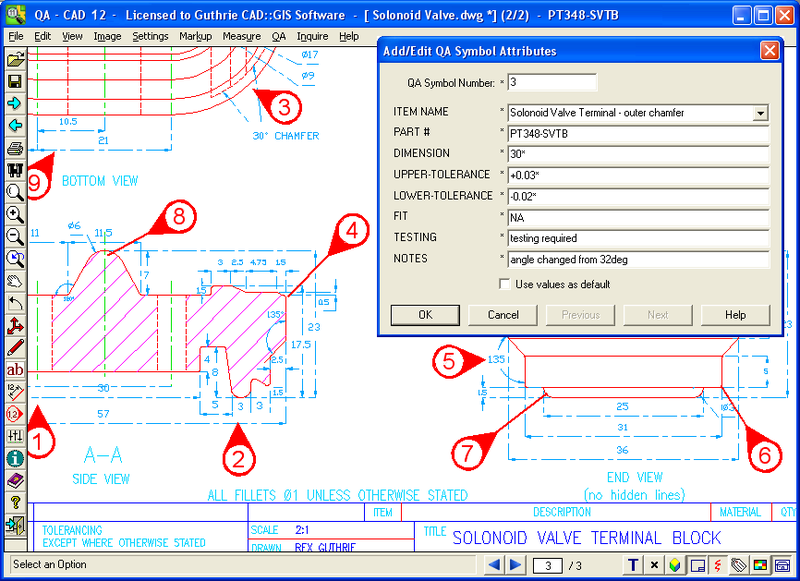 CAD Viewer 9.0 Markup QA licenses include all the features and functions of both the standard and Markup versions of CAD Viewer and also includes the valuable add-on extension "CAD Viewer Batch Command". CAD Viewer 9.0 Markup QA is the perfect tool for drawing revision management because it's easy to use and has many features for the professional user such as embedding field-based data and attributes into the stamps. This data can then be exported to a spreadsheet making it easy to manage your drawing revisions. Auto-numbered QA Stamps overlay the drawing. Data and attributes may be attached to each stamp and exported to a spreadsheet. Compare CAD Viewer versions here.